When we began digitizing scores from our collections over a decade ago, one area of focus was works from the operatic repertoire existing in multiple versions. If opera is a genre ripe for reinterpretations – as novels, plays, libretti, and scores themselves are recycled and revisioned – both of this week’s scores are products of the resulting palimpsest of musical influences. 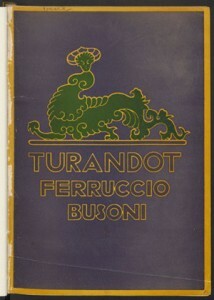 [Turandot. Vocal score]. Turandot : eine chinesische Fabel nach Gozzi in zwei Akten / Worte und Musik von Ferruccio Busoni; Klavierauszug mit Text von Philipp Jarnach. Leipzig: Brietkopf & Härtel, [c1918]. Mus 633.5.605. 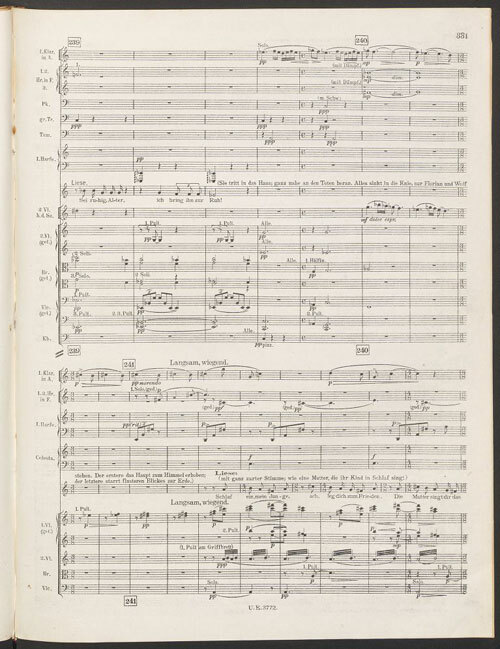 The simultaneous Frankfurt and Vienna premieres of Das Spielwerk und die Prinzessin (link to digitized vocal score) in 1913 had not been a success, thanks in part to a hostile reception by the Viennese critic Julius Korngold. Schreker condensed and extensively reworked the opera in 1915 and 1916; his revisions include replacing the original overture with the prelude to the second act, and changing the ending from the fiery disaster of the first version to a lullaby sung by Leise to her deceased son. The new, one-act Das Spielwerk premiered in Munich in 1920, conducted by Bruno Walter. 1. Busoni, Ferruccio, “The Turandot Music,” in The Essence of Music and Other Papers, trans. Rosamond Ley (New York: Dover, 1965), 61, http://hollis.harvard.edu/?itemid=|library/m/aleph|007922884 (HOLLIS record). Original text: “Ich habe ausschließlich originale orientalische Motive und Wendungen verwandt und glaube den konventionellen Theater-Exotismus umgangen zu haben.” Busoni, Ferruccio, “Zur ‘Turandot’-Musik,” Blätter des Deutschen theaters (Berlin), Jahrg.1 Nr. 6 (27 October 1911): 83-84, http://hdl.handle.net/2027/njp.32101018921104?urlappend=%3Bseq=99 (full text). 2. 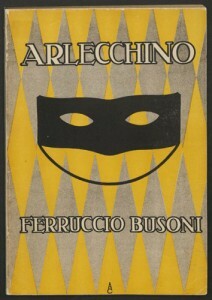 For an analysis of the sources used in the Turandot Suite, see Antony Beaumont, Busoni the Composer (Bloomington: Indiana University Press, c1985), 76-86, http://hollis.harvard.edu/?itemid=|library/m/aleph|000220150 (HOLLIS record). See also August Wilhelm Ambros, Geschicte der Musik: mit zahlreichen notenbeispielen und musikbeilagen, Vol. 1, Die Musik des griechischen Alterthums und des Orients (Leipzig: F.E.C. Leuckart, 1887-1911), http://nrs.harvard.edu/urn-3:HUL.FIG.GITEM:HW2LWX (full text). 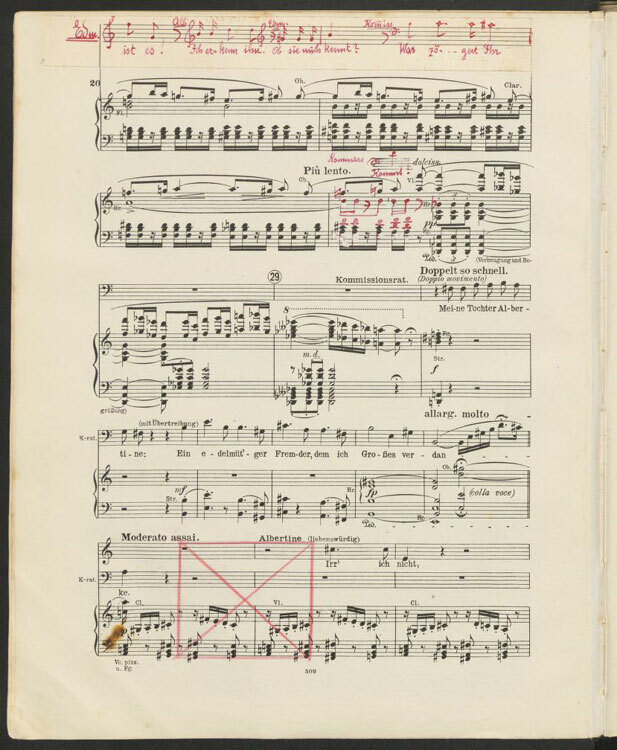 Our latest collection of digitized scores focuses on early 20th century works of musical modernism: operas by Busoni, Schreker, and Zemlinsky. As always, these and many other scores from our special collections can be found in our collection of Digital Scores and Libretti. Busoni’s first opera, with a libretto by the composer based on E.T.A. Hoffmann’s short story of the same title, from Die Serapions-brüder. This copy of the vocal score contains numerous cuts, corrections, and annotations – some pasted over the original score – which may represent a conductor’s revisions for performance. 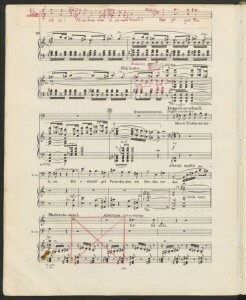 A vocal score of Busoni’s Mozartian one-act number opera, centered on the acrobatic Harlequin figure of the Commedia dell’arte: his first stylistic foray into Junge Klassizität (Young Classicality). 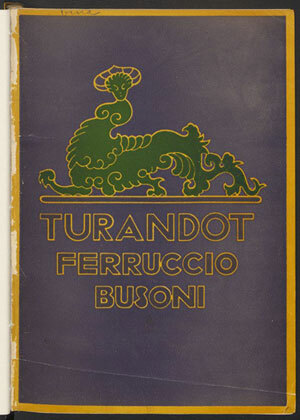 The work premiered on May 11, 1917, with Busoni’s Turandot. Schreker’s third opera, strongly influenced by Symbolism and later extensively revised to become Das Spielwerk. This copy of the score includes the spoken interlude “Des Burschen Traum in der Hütte des Meisters Florian” (“The Boy’s dream in the cabin of Meister Florian”), performed only for radio broadcast and not included in the libretto published in 1913. As he would do several years later in commissioning Georg C. Klaren’s libretto for Der Zwerg, Zemlinksy based his own libretto for Eine florentinische Tragödie on a work by Oscar Wilde: in this case, his unfinished play A Florentine Tragedy. A vocal score of the revised version of the comic opera, based on Gottfried Keller’s novella Kleider machen Leute. Originally produced as a three act opera in 1911, this two-act revised version premiered in Prague in 1922.